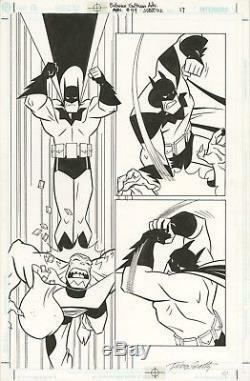 Batman Gotham Adventures#49 page 17 original comic book art pencilled by Tim Levins and inked by Terry Beatty on 11x17 Bristol board. Great splashy page with Batman taking down Killer Croc. Page is in very good overall condition. Please see pictures for actual piece you will receive. Ships flat, fast, free and well secured. The item "Batman Gotham Adventures #49 p. 17 Tim Levins Original Comic Art DC Comics" is in sale since Monday, April 16, 2018. This item is in the category "Collectibles\Comics\Original Comic Art\Interior Pages". The seller is "ninjasealed" and is located in Lowell, Massachusetts.